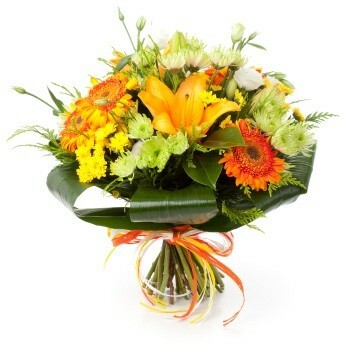 Pure optimism with this bouquet of flowers in shades of yellow and orange. This bouquet will bring a smile to the face of whomever receives it. Gorgeous bouquet filled with optimism to give as a gift to someone in Brazil. This bouquet features gerberas, daisies, one stem of yellow lily and greenery.